Includes approximately 100 hrs in addition to the initial hours necessary for Chi Kung Instructor/Practitioner Certification. Public group classes, individualized lessons and supervised instruction of Tai Chi Yang short and long, Double Edge and Broad Sword forms, Push Hands and self defense applications are included. The training is a proficiency program and some students will need more or less than the estimated hourly approximation. When intern has attained sufficient skill, a test of the Tai Chi Forms, Chi Kung and Nei Kung sets will be conducted with Seymour or a Certified instructor to decide if certification is to be awarded and/or what points require adjustment and fine tuning. Tai Chi, formally called Tai Chi Chuan means Supreme Ultimate Fist. 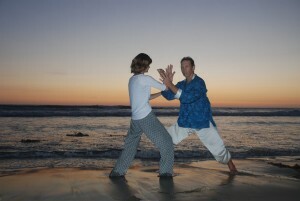 Tai Chi was conceived to integrate the forces of nature (Yang and Yin) into a martial art. When these correctly aligned natural body movements are coordinated with breathing and a still focussed mind, Tai Chi becomes a highly effective Martial Art that can be done at any age while simultaneously achieving great health benefits. The Tai Chi self defense applications of yielding, root power, using 4 ounces to deflect 1000 lbs, repositioning ourselves to a centered place and neutralizing powerful external forces, overflow into our ability to keep ourselves steady while flowing with the many otherwise exhaustive conflicts that arise in our life relationships. With a strong center, extreme situations (arguments, stress, sickness) become welcome fine tuning catalysts on the journey of our life purpose and for evolving consciousness. Practicing Tai Chi From, builds Jing (Life essence -a reservoir of energy that condenses to form the foundation and expands to catalyze the creative power of every body structure and human function), Chi -energy in motion, and Shen the calm and alert spirit that balances all mental functions.